Fox News anchor Bret Baier (with his co-author Catherine Whitney) has written a fast-paced and interesting account of Ronald Reagan and the end of the Cold War. 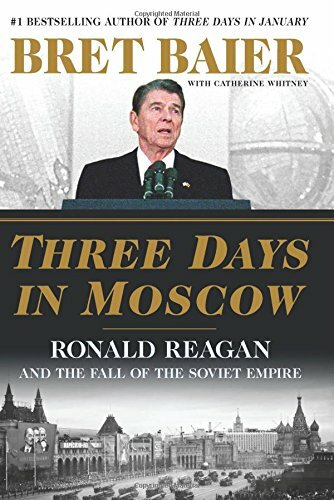 Three Days in Moscow refers to President Reagan’s trip to Moscow in late May 1988, where he held his final summit meeting with Soviet leader Mikhail Gorbachev and delivered a memorable speech to students at Moscow State University. More than half of the book is devoted to key events during Reagan’s presidency leading up to the Moscow summit. Baier highlights the evolution of Reagan’s public diplomacy toward the Soviet Union, which was shaped by Reagan’s key insight when he took office in 1981 that the Soviet system was rotting from within. This verbal offensive was matched by a huge military build-up at home, the controversial stationing of intermediate range nuclear missiles in Western Europe, and Reagan’s bold announcement of the Strategic Defense Initiative (SDI) which held-out the promise of a defense against ballistic missiles. Reagan’s critics in the West (and within the Soviet Union) portrayed him as a reckless warmonger driven by an ideological hatred of communism. Baier notes that Reagan’s hatred of communism was real and stemmed from his early battles against domestic communists in the movie industry in the mid-1940s as head of Hollywood’s Screen Actor’s Guild and his subsequent reading of history. Although not fully examined by Baier, that simple formula for victory was actually the result of careful planning by Reagan and his national security team. Now declassified national security documents show that as early as 1982, Reagan expressly established victory in the Cold War as a policy goal. Peter Schweizer in Victory and Reagan’s War, Paul Kengor in The Crusader, and John Patrick Diggins in Ronald Reagan and the Making of History prove beyond a reasonable doubt that Reagan had a strategy to bring about the collapse of the Soviet empire. The author notes that Reagan slowly but deftly shifted his strategy when Gorbachev became the leader of the Soviet Union. Reagan, he writes, sensed that Gorbachev was different from the prior generation of Soviet leaders. Indeed, Gorbachev clearly recognized that reform was necessary if the Soviet regime was to survive. Baier places great emphasis—perhaps too much—on the personal relationship that developed between Reagan and Gorbachev as the defining element of the end of the Cold War. To be sure, the personal trust that developed between the two leaders was important, but U.S. policies that exploited Soviet vulnerabilities—especially economic and political vulnerabilities—were more important. The author describes the high points and disappointments of the Reagan-Gorbachev summits at Geneva and Reykjavik, Iceland, where progress on nuclear arms limitations was seemingly within reach. Each time, however, Reagan held firm to U.S. defense priorities in the face of tremendous pressures to get a deal. Reagan was playing for time, it appears, because he sensed that time was on his side. Political dissension was building within the Soviet empire, especially in Poland. Soviet economic difficulties were multiplying. What Reagan told the British Parliament in 1982 about the illegitimacy of communist regimes was true. Baier rightly points to Reagan’s Berlin Wall speech in June 1987 as a pivotal public moment signaling that the endgame was near. Reagan defied both his State Department and National Security Council staff by calling on Gorbachev to “tear down” the Berlin Wall, which since August 1961 had symbolized a geopolitically-divided Europe and an ideologically divided world. After summarizing the events that ended the Cold War and celebrating Reagan’s achievement, Baier describes the current dismal state of relations between the United States and Vladimir Putin’s Russia. It is a sobering end to an otherwise optimistic book. And it reaffirms the reality of international politics that no resolution is ever permanent; no victory is ever final.